The small kitchen pantry in this Waconia home was being advertised to prospective buyers as an amenity, but because it was overstuffed and disorganized it wasn't worth showing off. "Storage is always a big issue for buyers, whether they're upgrading to a larger home or downsizing," said Lori Matzke of Centerstagehome.com. 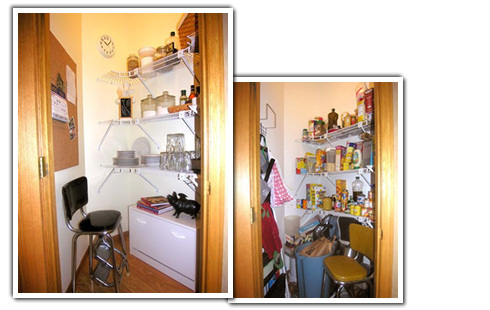 "If you're lucky enough to have a dedicated storage pantry, you want to show it as an organized and useful part of your kitchen layout, not just a place to shove all your extra junk." To make this pantry feel like it's part of a working kitchen and to make the space feel more organized, here's what Matzke suggested to create a little pantry envy for potential buyers. 1. She boxed up about two-thirds of the food stock -- mainly canned goods -- and removed everything else not kitchen-related, including the dog dishes and garbage can. "A garbage can in the same pantry where you're storing food is probably not a good idea," she said. Matzke marked the boxes and stored them in a secondary bedroom closet, out of sight but close enough for easy access. 2. After editing the contents of the pantry, Matzke cleaned the wire shelving with a bleach-based solution and a damp cloth. To prevent further scuffing and to keep items from falling between the wire openings, she put several white particle-board shelves on the wire shelving. 3. The walls in this pantry had been painted a flat white, so Matzke repainted them a soft shade of light almond with a semigloss finish that helps brighten up the space and make it feel more cheerful. 4. To make the space feel more organized, Matzke bought a few inexpensive wicker storage bins for smaller items and a $32 assemble-it-yourself cabinet for larger items. She bought several large glass and plastic containers to stow kitchen staples -- including flour, sugar and rice -- that look nice and provide easy access. Reorganizing these shelves created more room for dishes, glassware, small appliances and cookbooks that had been previously taking up space on the kitchen's countertops. "Not only did moving the appliances help de-clutter the kitchen, but displaying a few larger items rather than all that little clutter made the pantry feel more spacious," she said. 5. To make this small space feel even more functional, Matzke created a full-size bulletin board using cork tiles that she bought for $1.50 apiece at a discount store. She attached them to the wall using double-sided adhesive tabs. The bulletin board now can be used to display items that had been cluttering up the refrigerator door, including the homeowner's daily calendar, postcards and the local school lunch menu. 6. Matzke updated a vintage chrome step-stool by recovering it in black vinyl, and she created additional visual interest with a white wall clock for just $6. Plus, she threw in a couple of ceramic pigs from the owner's collection.